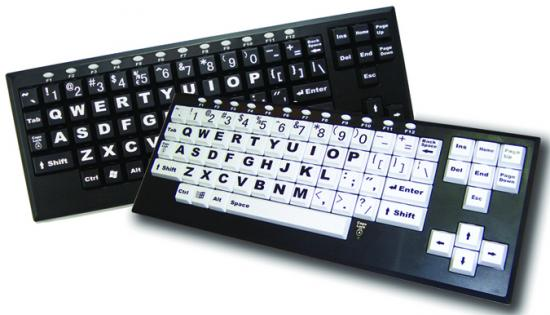 ChesterKeys provides an adjustable Bluetooth keyboard with all controls, ports, microphone, and camera easily accessible. Perfect for Facetime! The keys feature extra-large font for increased visibility and include all the function keys you would need with an iPad such as, Home, Volume, Search, Internet and more! The soft faux leather case closes securely with a magnetic clasp. The iPad will rest securely with the built in, collapsible stand that can be angled for optimal viewing. The rechargeable battery provides 120 hours of continuous use. TrekKeys features a roomy layout, super-slim design, white-on-silver color, and natural key feel. You can control media access to iPhone, iPad and Galaxy Tab apps using hot keys on the top row. The re-chargeable built-in Lithium battery offers approximately 120 hours of continuous use. TrekKeys is compatible with most iOS, Android and Windows devices. You can easily toggle back and forth from typing on your PC, tablet or smartphone with the simple press of a button. Children as young as three years old are becoming skilled at using the computer keyboard. But the use of upper case letters can be confusing for those who have not mastered the relationship between capital and lower-case letters. Good news. 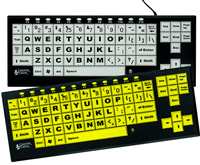 The MyBoard-lc has large, bold, easy-to-read lower-case lettering, big 1" keys, color-coding for vowels, consonants, numbers and function keys, and gentle finger pressure. MyBoard-UC is a large-key computer keyboard that can assist children with vision or motor-skill impairment, and is an excellent first keyboard for any child. The MyBoard-UC has big 1" oversized big keys and large, bold, easy-to-read numbers and UPPERCASE letters and features color-coded consonants, vowels, numbers and punctuation marks to help pre-school children learn their character sets. The KinderBoard is a large-key computer keyboard that can assist children with vision or motor-skill impairment, and is an excellent first keyboard for any child. The KinderBoard has big 1" oversized keys and large, bold, easy-to-read numbers and letters. Voted "Best Pick of 2007" by Scholastic Teacher's Instructor Magazine, the KinderBoard features color-coded consonants, vowels, numbers and punctuation marks to help pre-school children learn their character sets. The KinderBoard also features two USB 2.0 side ports and F-keys. Big Blu KinderBoard uses wireless Bluetooth technology so you can use it with your Bluetooth enabled PC, MAC OS and iOS devices. The VisionBoard2 improves readability and reduces eyestrain with big 1" square keys and large, bold black-on-white letters and numbers. Users with low vision or functional limitations can increase and improve capabilities with greater comfort and control. 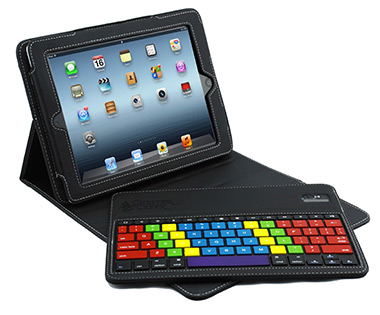 The VisionBoard2 also features two USB 2.0 side ports and F-keys. Also available with black-on-yellow keys. AbleNet's large print keyboards have been designed specifically for those with conditions that cause visual impairment or low vision, such as: Macular Degeneration, Glaucoma, Diabetic Retinopathy, Cataracts, Age related vision loss. With a bigger and bolder typeface, the keys are easier to see. Designed for users with limited hand control, motor skill difficulty, hand-eye coordination challenges and/or involuntary muscle spasms. Features an oversized trackball with silky smooth movement that requires only the slightest touch. Color-coded buttons allow for left/right clicks and drag lock. Features two switch jacks for alternative access.